Okay, now that that's out the way, watch the trailer everyone is talking about: 'Vacation'. It's the next generation of Griswolds. New Line Cinema’s 'Vacation' stars the always hilarious deadpan of Ed Helms ('The Hangover' films) and Christina Applegate (the 'Anchorman' films) as they take the family on the road for another inevitably ill-fated adventure. (The film marks Jonathan Goldstein and John Francis Daley’s directorial debut). Following in his father’s footsteps and hoping for some much-needed family bonding, a now grown-up Rusty Griswold (Helms) surprises his wife, Debbie (Applegate), and their two sons with a cross-country trip back to America’s “favourite family fun park,” Walley World. Rounding out the cast are one of my fave actresses Leslie Mann ('The Other Woman') as Rusty’s sister, Audrey; Chris Hemsworth (the Thor films) in the role of Stone Crandall, Rusty’s irritatingly successful brother-in-law; and Skyler Gisondo ('Night at the Museum: Secret of the Tomb', 'Hard Sell') and Steele Stebbins ('A Haunted House 2'), who play Rusty’s sons, James and Kevin. In the best news ever, yes: Chevy Chase and Beverly D’Angelo reprise their roles as Clark and Ellen Griswold from the classic Vacation comedies. 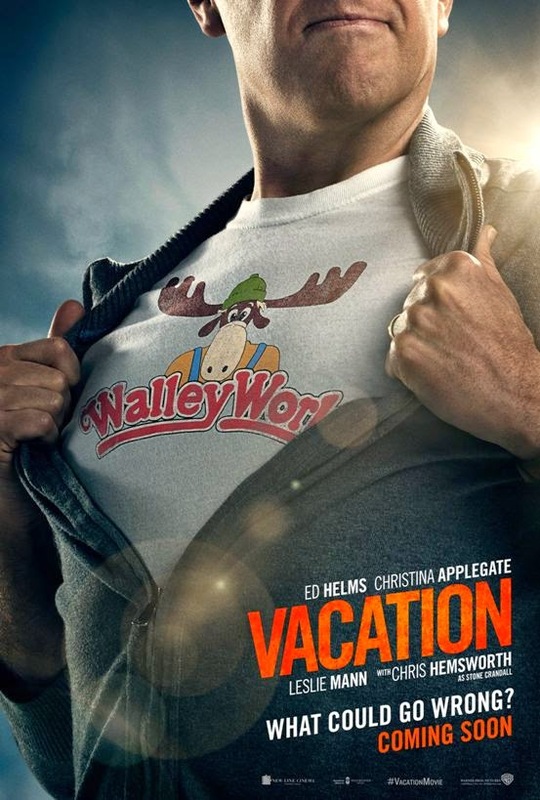 VACATION is scheduled for release in Australian cinemas on August 20. Someone made a GIF of Chris Hemsworth's bulge. Hey, I am just reporting it, 'kay.